Adrian Martinez tries to escape the grasp of Wisconsin's T.J. Edwards. Two steps forward, one step back. That’s progress, right? Except when you’re playing in Madison, where there’s precious little room for missteps. Wisconsin played its usual brand of wear-’em-down football, and Jonathan Taylor scorched Nebraska for another 200-yard, multiple-touchdown game. So the beat goes on for the 4-1 Badgers, who rushed for 370 yards and have positioned themselves well for another Big Ten West title. But Wisconsin’s 41-24 win over Nebraska Saturday night at Camp Randall Stadium did not leave the bitter taste that last year’s loss in Lincoln did. That’s a bit odd, considering last year’s final score (38-17) and rushing total (353) were similar. But an 88-yard touchdown run by Taylor did much of the second-half damage this time, whereas last year the Husker defense looked weaker on every fourth-quarter play. Last year’s Huskers were starting to let the season spiral out of control. This year’s team seems to be building toward a stronger second half of the season. That’s the sense I got from listening to coach Scott Frost’s postgame press conference. Frost seems to believe his team has learned some valuable lessons in the past week. There are a lot unexpected twists and turns to this learning business, especially against Big Ten teams. So when Tyjon Lindsey and Greg Bell, who once were highly touted skill players, packed their bags and left town this week, things easily could have spiraled out of control the way they did last year in Lincoln. That didn’t happen; there was a perceptible amount of backbone shown by both the coaching staff and players. Nebraska is still atrocious on third down on both sides of the ball, and the penalty addiction is still strong (10 for 100 yards), but there were things to like about this game. 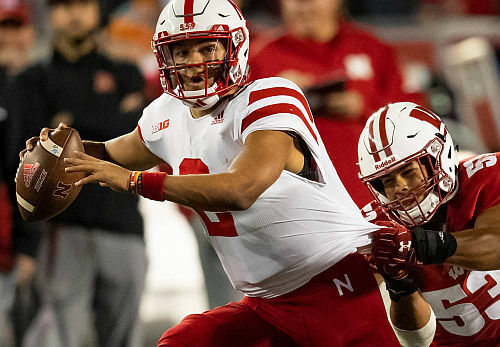 A lot of it was the passing combination of quarterback Adrian Martinez to wideout J.D. Spielman, who had nine catches for 209 yards and a 75-yard touchdown. Barring serious injury, Spielman is a future NFL talent at slot receiver. Less than halfway through his sophomore season, Spielman is already 14th on Nebraska’s all-time receiving yardage list. As for Martinez, the 18-year-old true freshman is learning to make big-time throws against big-time teams. He was 24-for-42 for 384 yards and no interceptions (although the Badgers could easily have had a pair of picks). The next step? Learning to do it in big-time situations. Martinez is looking great after NU gets behind and in essence, the pressure is off. His 441 yards of total offense were a Nebraska freshman record, and it was the second week in a row he eclipsed the 400-yard mark. The Huskers are 0-5, but they’re not in freefall mode, either. They seems to be figuring out a few things. The offensive line is subpar, to put it charitably, but the pass blocking looked better at times against the Badgers. The next step? Learning to convert third-and-short in big-time situations. And then, learning to run the ball consistently, which is absolutely achievable considering the passing threat Martinez is becoming. Wisconsin proved again that a rushing yard is worth much more than a passing yard. Nebraska ran 68 plays from scrimmage to Wisconsin’s 72, which was a much smaller discrepancy than I expected. The Huskers who decided to stay may have just clawed themselves a handhold to give themselves a decent shot at climbing out of the muck. Is the foundation built? Not by a long shot, but I think I saw a footing being dug. And maybe we got a peek into the future when BTN play-by-play man Kevin Kugler said that freshman tight end Cameron Jurgens may transition to center by next season. Having a premium athlete at center would be a welcome change. Reasons for optimism? The main one was that NU kept playing hard throughout the game. There were others. NU stopped Wisconsin twice in the red zone, forcing the Badgers to settle for a pair of first-half field goals. Redshirt freshman nose tackle Damian Daniels was responsible for one of those when he broke through the Badger o-line and disrupted a second-down run. Since the Colorado game, getting any kind of disruptive play by someone other than Mohamed Barry, Luke Gifford or Ben Stille is a bonus. In the second half, Nebraska played the Badgers dead even on the scoreboard and recovered a Wisconsin fumble late in the game. Freshman placekicker Barret Pickering made a 31-yard field goal in the first half, his only attempt of the game. And there was a tight end sighting, when sophomore Jack Stoll made a fine touchdown catch in the second quarter. Nebraska may have found a new punter. Caleb Lightbourn simply was not getting the job done whenever he tried to directional-kick the ball. Junior walk-on Isaac Armstrong, the left-footer from Lincoln Southwest, had two excellent punts. It seems like an eternity since NU was in good enough field position to punt the ball out of bounds inside the opponent’s 15-yard line, but Armstrong did it Saturday night. Those are small steps, but steps nonetheless. The penalties hit at critical times. Probably none were more damaging than late in the first half, with Nebraska trailing 13-3, sophomore tackle Matt Farniok was called for “hands-to-the-face” on third-and-12, which nullified a long pass to Spielman that would have set up the Huskers with a first down in the red zone with a chance to cut the lead to 13-10. Instead, Wisconsin held on downs, and churned 63 yards in the final two minutes of the half against the tiring Husker defense to widen the gap to 20-3 at halftime. But frankly, several of the penalties were questionable at best. Nebraska has a well-deserved reputation among Big Ten officials, who are looking for the slightest excuse to throw their yellow flags. But I think they showed hyper-eagerness on a long kickoff return by Marcus Washington. I’m still trying to figure out how someone can be called for an illegal block without using his hands or shoulders, while trying to stay clear of the defender. That Husker was a step slow getting into position, and it cost him. Frost and Nebraska seemingly have a journey of a thousand miles back to Big Ten relevancy, but just a step or two, taken at the right moment, could make a world of difference.